Creative people (like me) enjoy playing games. But then we want to make a game. So we usually start with making a board game. And if we want to take it another step forward, we make a digital game. My friend and I want to make a digital card game. But we don’t know where to start. Luckily, I met Yang Pulse who shows us how to make a digital card game. Hi, I’m Yang Pulse and I’m a producer at Impulse, an indie entertainment studio. Our first project is Zems, a tactical online card game with interactive environment and weather. I grew up in Oklahoma City but currently reside in Austin, TX. The first games I played were JRPGs (Japanese Role Playing Games) like Pokemon and Golden Sun. I got into game development after playing Mario Party at my neighbor’s house – I thought the rules and mechanics could easily be translated to board and dice so I made my own spinoff with outside minigames. It was a lot of fun! 1. How do you go about creating a digital game? Game development usually starts as either a top-down or bottom-up process. 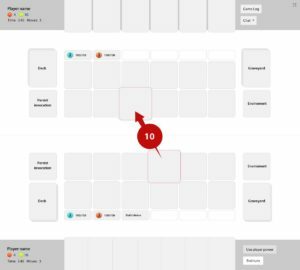 Top-down is where you plan the theme, setting, and genre beforehand (think mainstream blockbuster games). Bottom-up is where you experiment with an idea for a mechanic or two and then after it proves to be fun, you decide to build a game around it (i.e. Portal). The major risk with top-down is that your game can turn out to not be as fun as you imagined after making the prototype. The struggle with bottom-up is making a complete game around the mechanic(s) can be difficult. Starting digital development involves knowing how to research. With the plethora of tutorials and free software available on the Internet, finding the tools and learning the skills to make a basic prototype of your idea is just a matter of persistence. 2. What software do you recommend first time video game designers use? If you have no experience with code, Construct 2 can be a great starting point because it has visual scripting. If you have some coding experience, Unity and Unreal are market-proven options. It’s important to keep in mind that tools are exactly that – tools. There are a lot of technology debates online and it’s important to not get caught up in them when starting out. If you need a project-driven course to guide you along, I recommend either The Complete Unity Developer or The Unreal Developer Course. I’ve personally gone through the Unity course and highly recommend it for anyone wanting to go from zero programming experience to making games and simulations. 3. What steps did you take in planning out your game? I started with a bottom-up approach. Zems’s core premise is an online card game where cards turn into units on the board that move and attack. We used wireframe concepts (see image below) early on in order to test different game grids. 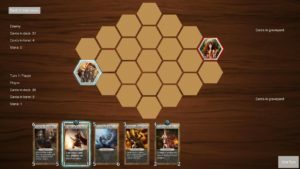 Eventually we settled on a connected hex grid. With more experimentation, we added new elements such as interactive weather and environment. After I was confident in the core mechanics, I worked with a writer to create a basic setting and establish themes. It was at this point when I was ready to transition the project from prototype to full game production. 4. Was it difficult playtesting a digital game? Many collectible card games exist so it wasn’t difficult to playtest on paper first. However, I quickly learned I needed a digital prototype because game kinesthetics are far different when you’re not physically holding cards and moving pieces on a board. This was created by myself, another programmer, and a few artists in about 4 months. We hadn’t decided how we were going to represent the units on the board yet, so we used hex pieces matching the shape of the grid tiles. Building this prototype wasn’t difficult, but it raised a lot of important design questions and the lessons we learned from internal testing were paramount. 5. How did you publish your game and what was most challenging about this process? Zems is self-published. It’s an online game and we always want players to run the latest version. During our alphas, we pushed a lot of bugfixes and balance changes so ensuring we had a robust launcher was a crucial milestone early in development. Shortly after Alpha 2, we ran a successful Steam Greenlight campaign. This gives us the right to publish the game on Steam when ready. We ran the campaign at the same time as our Kickstarter to cross-promote traffic. I recommend the same to anyone planning to crowdfund with the intention of publishing to Steam. 6. How long did it take you to take Zems from the planning to the publishing phase? Resolving work conflicts across two teams (client and server). We used a lot of placeholders and temporary assets because our main goal was to get feedback on the game concept itself. Overall, reception was very positive. 7. How and where did you promote your game? We worked with NovyPR to spread the word to various press, but we did not have as much exposure as I would have liked. Our Kickstarter did not succeed partly because we did not have a large fan following beforehand. It’s important for anyone wanting to run a Kickstarter to realize the community must be relatively big prior to the campaign. Gaming news sites like Alpha Beta Gamer by talking to their journalists. One of the most important marketing tools we use is a mailing list – pretty much all our marketing efforts were driven toward getting players to sign up for our newsletter. Being able to centralize our communication method is how we kept players up to date on our alpha events. 8. What did you find to have worked best in promoting your game? Reaching out to gaming news sites and convincing them to retweet or write an article about Zems had the greatest impact. It can be difficult to get their attention because they are often bombarded with messages by developers. Thankfully, if you don’t succeed the first time, they likely skipped or forgot about your first email and you can try again a week later. It’s important to allot time and effort to marketing in addition to development – just because the game is ready doesn’t mean you should publish immediately. Timing is critical. 9. What are several things you wish you did differently when creating Zems? Everything in Zems that got cut was a learning lesson. Some scrapped features cost money, so if I could do anything differently it would be realizing red flags in decision making much sooner. For example, I hired a shader programmer to create a visual effect because I wanted to reproduce what I saw in another game. However, my visual effects programmer came up with something unique that I liked, so I ended up scrapping the special shader effect and losing money that could have been spent elsewhere. Sometimes I think I know what I want when in reality I just haven’t seen all the options that are just as good – one of my flaws as a person is limiting myself to my own imagination. 10. Why did you set out to create your game? I grew up playing collectible card games like Yugioh and Magic: The Gathering. I also played a lot of Chess and in general love strategy board games. I believe there aren’t enough games that marry the two genres. Zems started from a bottom-up exploration of how it might be done. I failed to realize client-server integration could be problematic because Alpha 1 went smoothly. When I set our original Alpha 2 release date the day after integration, we ended up missing it and letting our players down. We eventually fixed our issues and held Alpha 2 three weeks later. Lesson learned: Give yourself plenty of time after it’s “supposed to be ready” to make sure everything works properly. During Alpha 2, matchmaking entered an infinite loop after a player in queue failed to log out properly. This prevented all players from being able to join games. We weren’t able to immediately determine the cause of the issue, so we decided to restart the server. Unfortunately, we didn’t have a proper restart procedure in place, so the reboot took longer than expected. Lesson learned: Have a proven process for hard resets (while players are still logged in) before you go public. In both alphas, I didn’t put enough emphasis on a proper user account structure. This meant usernames were case sensitive – if you registered as ‘JohnDoe’ you wouldn’t be able to login as ‘Johndoe’ because the game expected the case to match. This caused a lot of login issues that I glossed over during Alpha 1 because of a smaller playerbase. Lesson learned: If you’re going to have users log in, make sure you test the login experience in addition to actual gameplay. 12. What software does your team use? If you’re starting out, I recommend only using the tools you need and adding more when necessary. 13. Anything else you want to share for someone interested in digital game development? If you’re not sure what you want to make, pick a non-RPG you really enjoyed and try to clone it. This will teach you a lot about how to implement certain features. If you want to design your own game, I suggest starting bottom-up. This forces you to focus [on game design and balancing] instead of creating a vast concept that may not even be as fun as you imagine. Game development is a difficult but rewarding process of learning and self-discovery. I hope my thoughts are helpful to anyone starting out. And thank you for teaching us how to make a digital card game, Yang. I feel like I have all of the tools and resources ready for me at my fingertips. Now I just need to get my game concept figured out and get to work! If you want to play Yang’s game, then signup to be notified when the next Zem’s alpha will be held. Or you can see what his company is about here. And finally, check out more about his personal projects (and resume in the menu) to see what he has accomplished. What did you learn from the talented Yang Pulse today? Was there a follow up question you would like to ask? Let us know in the comments below and we can try to help you better learn how to make a digital card game.